Annie, Minnie and May Prat, adventurous sisters from Wolfville, Nova Scotia, embarked on unusual artistic careers in the United States in the late 1890s. In 1896, Annie, 35, enrolled at the School of the Art Institute of Chicago. 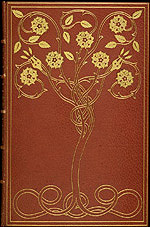 In 1897, Minnie, 29, moved to New York City to learn bookbinding with Evelyn Nordhoff, who had herself apprenticed in England with noted Arts and Crafts bookbinder, T.J. Cobden-Sanderson. May Rosina, 26, joined Minnie shortly afterward to study decorative leatherwork and bookbinding with Nordhoff. The sisters had a fascinating circle of friends, centered around the Prat family home in Wolfville. Chief among them were poets Charles G.D. Roberts and his cousin, Bliss Carman, and Charles G.D.'s younger brother, Goodridge, who was engaged to Minnie. In 1892 tragedy struck the Prat family circle. On February 4, a month before Minnie's 24th birthday, Goodridge, 22, died of influenza at the Prat family home. Her father, Samuel, died of the same illness nine days later. Five years later, Minnie found the courage to go to New York to apprentice with Nordhoff, in a field in which women were still pioneers. Bliss Carman, then living in New York, had arranged for the apprenticeship. Evelyn Nordhoff died unexpectedly in November 1898, at the age of 33, after a short illness. Minnie, May Rosina, and other former students kept her bindery going after her death. In addition to an illustrated essay, there are images of their artwork, bindings, letters, and this wonderful photograph of May Rosina Prat and Dorothy Cornell operating the book press at Dorothy's book bindery at 'Forest Park' in Ithaca, New York. Hand binding is …a part of that wide, recent movement against the machine which demands opportunity for artistic expression in the crafts as well as the high arts. From the Princeton University Library, Unseen Hands: Women Printers, Binders, and Book Designers. From Oak Knoll Press—the book Women Bookbinders, 1880-1920 by Marianne Tidcombe about women binders in Britain. And then there is this fascinating study of unions among women binders published in 1913 by the Russell Sage Foundation. this is so cool, who knew? not me! thanks Susan. I'm going on a hunt now for some of the works you mentioned. I love book binding. What a wonderful post, Susan. This topic would make a great artist book!